Vivienne and Theodore Spooner won't be staying with us too long. They are already two months old and just need to spend a little time with us while they fatten up. Most likely be leaving in just a couple of weeks. Their quarantine won't be as long as it normally is, so Butterbean will get a chance to mingle with them soon. They came into the shelter with two siblings, one tabby and one tux, and the four of them spent a little time getting over some bugs and gaining weight in Vet Treatment. Their slightly larger siblings had surgery last week, and went into the cattery for adoption. I'm sure they got snatched up already. They were adorable. Vivienne and Theodore are nearly all white, with the exception of a few faint black smudges on the top of their heads. Both our floofy, but Theodore's coat is slightly floofier. He has more ear hair too. 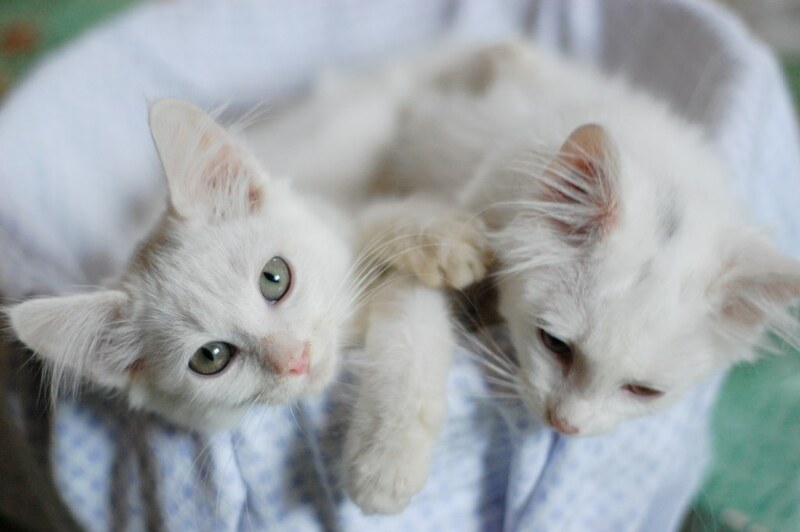 These two are sweet, social and affectionate kittens. The second they see you, their eyes get big and bright, the purring starts, and their tails go straight up in the air. They are lovely, lovely beings and their visit with us just isn't going to be long enough. They're quite photogenic, so even though their visit will be brief, there will be lots of pictures! Charlene really is the Henry Higgins of cats, isn't she? The real question is will Drewster play the part of Col. Pickering? It's great that there are kittens in the house again. I bet the Bean is thrilled about it. How did you book project go? I hope they find homes as quickly as their brothers. Awww! Sweet little faces. Love the ear hair. Do they have plumey tails, too? Such sweet little faces. Vivienne is quite the charmer. They have such bright, expressive little faces. Their permanent human family is going to get a lot of affection and entertainment. Sometimes white cats can't .. I love these vanilla kittens - such sweet faces! Charlene must be over the moon - bet she isn't bored now! Those are NOT real kitties?! They must have been created in a secret Japanese cuteness lab. Ear floof extreme! I think they are beautiful. 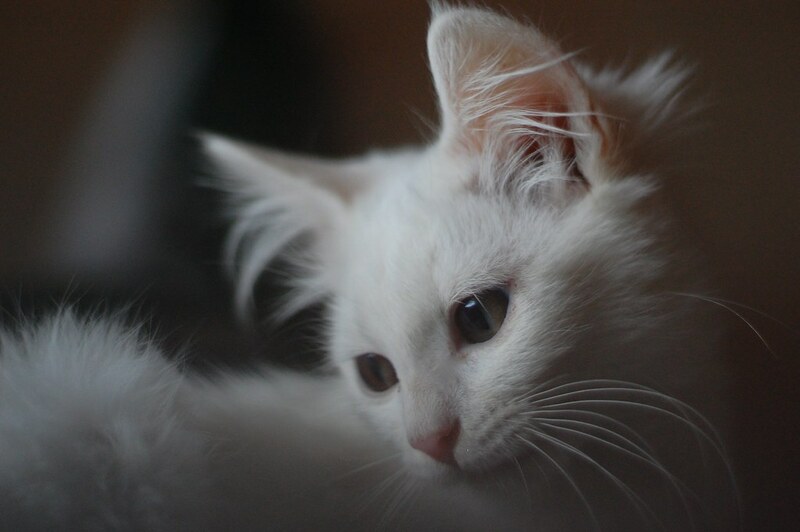 I have a real need to adopt a white fluffy kitty. Wish I was closer, I'd take one of those. Just adorable. I'm still completely captivated by these two! They are so adorable!! I'm happy to see the pictures of them!! omg i totally want to eat them up. They are so amazing, and that ear floof just KILLS! They are stunning, distinguished little ladies. It's not often that you get white kitties! Just too precious! I love solid white kitties. I had one for years who was deaf. He lived in his own little world and was just too funny to watch. He learned a form of sign language from us and never missed a call for a meal or play time! If your babies are hard of hearing, who ever adopts them should cherish the deficit. To the kitties, it's normal. They have no idea they're really supposed to hear. They're precious as they play and sleep and eat and love their human mama and daddies. 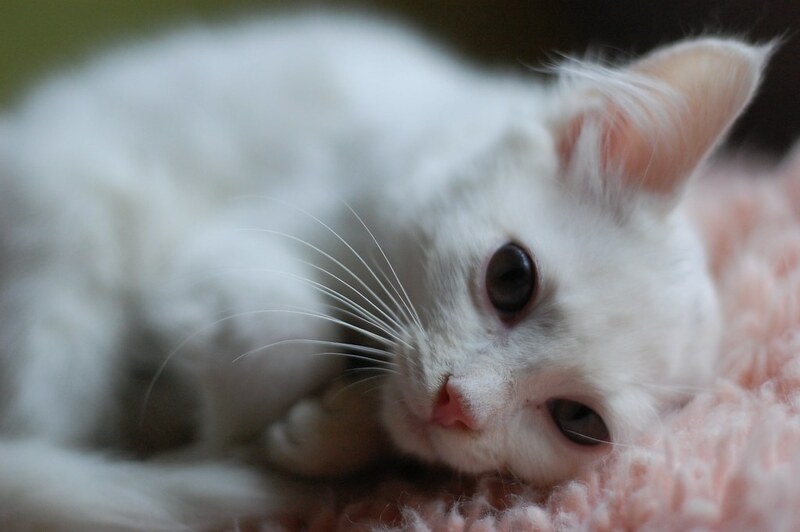 I'm another who had a deaf white cat - she was also blue-eyed, which I've heard is common. She was a very sweet kitty, and didn't let her lack of hearing bother her. Like Kathleen above said - she didn't know she was supposed to hear! What amazing ear floof! They look just as sweet as sugar. I bet Ms. Bean will just eat them up. Oh I want to spooonnn with the Spooonnners under a June Mooonnn.... No? They want to come & live with meeeeeeeeee! Oh how gorgeous this kittens are. I will treasure every photo we get to see, since they are already short-timers! I am glad you found a project for Charlene. She was sounding mighty desperate! How is your book project going? we had two white sisters when i was a wee bit. these remind me of them, and they are beautimous! That IS remarkable ear floof. Amazing! I could not give them away. Ever. I love them.